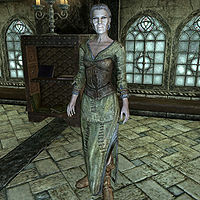 Inge Six Fingers is an elderly bard and the Dean of Lute at the Bards College in Solitude. When you are officially declared a member of the college at the end of Tending the Flames, she will ask you to retrieve the first hand-crafted eight-string lute ever created, starting the quest Finn's Lute. At the Bards College, classes start very early in the morning, so Inge gets out of bed at 4am and positions herself in the downstairs library, ready to teach Ataf, Illdi, Jorn, and Aia Arria a lesson (see bugs). At 8am she observes her colleague Pantea Ateia teach the same four students in the eastern classroom. The class ends at noon and Inge takes a two-hour break, either eating, relaxing, or strolling around. She then joins the Dean of History, Giraud Gemane, for the 2pm class in the library on the ground floor. When class is dismissed at 6pm and most of the teachers and bards head for the local tavern, Inge instead heads straight down to her quarters and goes to bed. She wears a set of farmers clothes and a pair of boots. She carries the key to the college and a selection of upper-class items and gold. As a teacher she is strict and to the point, a behavior reflected in her greetings: "I'm Dean of Lute at the Bards College, and no, I don't give private lessons. ", "It takes two things to be a good teacher. The first is patience. The second is a firm wooden stick for rapping knuckles." and "Only reason I'm so good with a lute is because I'm old. It takes a lifetime to master." If you haven't joined the college yet, she will also tell you not to bother: "You here to apply at the Bards College? Well don't bother - you're too damned old. Start past four, and it's all wasted effort." After Tending the Flames, Inge will be somewhat sad and will start to say: "It makes me sad whenever I think about it." She will then elaborate: "Hmm? Oh, sorry. My mind wanders sometimes. I was just thinking about Finn's Lute. Over a year ago, thieves broke into the college and made off with a lot of valuable things. Mostly gold and silver. But they also stole Finn's Lute. We just learned where the bandits fled to, and I very much want that lute back." She will also explain the historical importance of the lute: "Finn was the bard who invented the eight course lute that is commonplace today. Until he found a way to string the extra courses, bards only had six course lutes. The lute they stole is Finn's original eight course lute. I doubt they even realize its true value." When you return Finn's Lute to her, she will be grateful and reward you with some free training: "What? You did? Oh sweet Divines! You did! There is no way I can pay you what this Lute is worth. But I can teach you a few tricks I've learned over the years." She will then return to her usual personality and finish the conversation with: "We're done then? Good." or "Glad that distraction's over..."
Viarmo: "How are your students coming along?" Inge: "Some of them have a long way to go, but they're mostly passable. Don't let them hear I said that, though!" Viarmo: "Of course not! Complacency is the bane of art. They're in good hands with you, Inge." Inge: "Your solo performance is about a week away. I expect to hear your early rendition tomorrow, understand?" Jorn: "I've converted the classic tale of Eyldi the Bear to be performed with drums. I think you'll be impressed!" Aia: "At this point, I hardly see how your advice would improve it. It's flawless." Illdi: "Oh, thank you! I've been working on an original piece. I hope it can stand up to the classics!" Inge: "I'll be the judge of that. Now, back to your practice." Inge was supposed to teach the students at 4am, but was given the wrong location code. As a result, the students will sit in the upstairs classroom without a teacher, while Inge will stand in the library downstairs.